The 2015 Bahrain Grand Prix meeting got under-way today with the two Friday practice sessions at the Sakhir International Circuit. Kimi Raikkonen and Nico Rosberg were the two fastest drivers from each session, with the stage seemingly being set for a duel in the desert between Mercedes and Ferrari on Sunday. Practice one would always be a slightly irrelevant session due to the fact that neither qualifying or the race would be run in the hotter conditions of the afternoon in Bahrain. Kimi Raikkonen was the man who would top the session by 2 tenths of a second ahead of team-mate Sebastian Vettel. 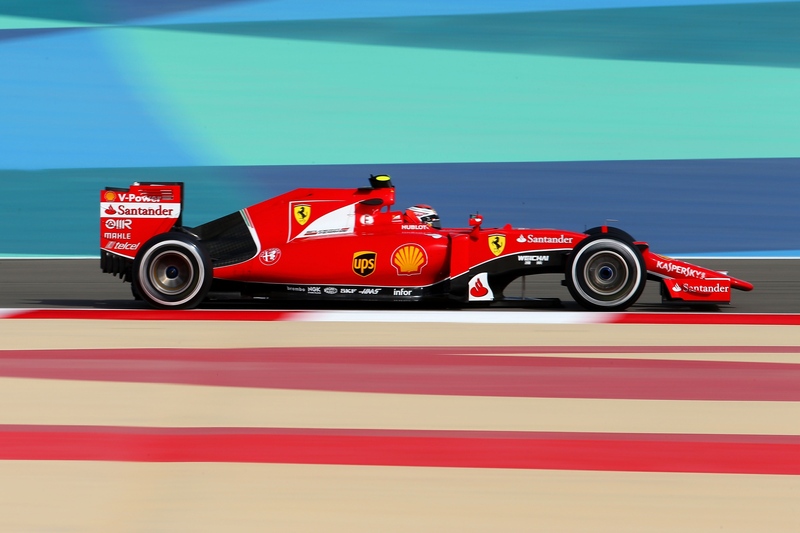 Raikkonen was the only man to get inside the 1’37’s after 13 laps of the Sakhir circuit. Valtteri Bottas finished 3rd fastest ahead of the Toro Rosso rookie Carlos Sainz. Carlos was just 6 tenths off of Raikkonen’s fastest time in P1. He was closely followed by fellow Red Bull-sponsored driver Daniel Ricciardo and the second Toro Rosso of Max Verstappen. McLaren seemed to have a majority of the issues worked out on one side of the garage, with Fernando Alonso setting the 4th fastest time in the Honda-powered MP4-30. He was within a second of his former team Ferrari; perhaps owing to the irrelevance of the session. On the other side of the garage, Jenson Button failed to set a time after a battery problem. Daniil Kvyat set the 9th fastest time for Red Bull and was sandwiched between the two Felipe’s, with Nasr in 8th for Sauber and Massa in 10th for Williams. Only one driver was making a practice appearance, with Jolyon Palmer getting out on track with Lotus for the second weekend in a row. The reigning GP2 champion completed the most laps of anybody in Romain Grosjean’s car after 31 tours of the circuit. He ended the session in 14th and was 1.4 seconds off of the fastest time. Palmer was ahead of both Mercedes cars, with 15th placed Rosberg and 16th placed Hamilton focusing on long runs instead of setting fast laps. With darkness having fallen on the circuit, the drivers headed out onto a more representative circuit to which they will be facing in qualifying tomorrow and the race on Sunday. Normal service was resumed at the top of the time-sheets with the two Mercedes drivers returning to their expected positions in first and second. 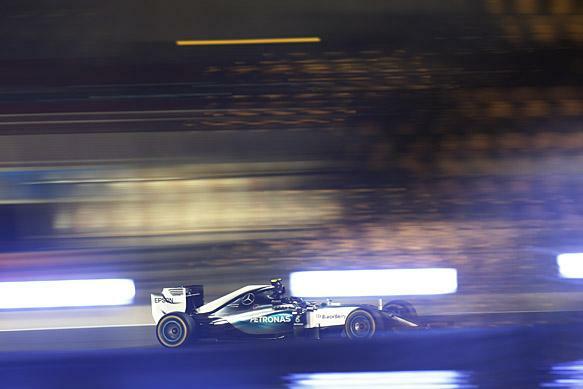 Nico Rosberg topped the session by 1 tenth ahead of Lewis Hamilton, with the Silver Arrows’ nearest rivals of Ferrari a further 4 tenths back, with Raikkonen beating Vettel for the second session in a row. Vettel suffered a brake failure when exiting the pits with 10 minutes remaining, which subsequently put him into the firing line of Sergio Perez, who broke the front wing off of the Ferrari. The debris brought out the only red flag of the day. Vettel’s team-mate was also subject to some drama, with both himself and Lewis Hamilton being investigated by the stewards for failing to leave the pits correctly after driving around a number of cars who were waiting at the end of the pit-lane. Valtteri Bottas was just a few thousandths off of Vettel’s Ferrari, with Daniel Ricciardo and Pastor Maldonado relatively high up the field than you might’ve thought in 6th and 7th respectively. Nasr, Kvyat and Massa maintained their positions of 8th, 9th and 10th from the first session to complete the top 10. Button made it out on track after suffering battery problems in FP1, but the Briton was quickly back out of the car after stopping just before turn 10. He did manage to return to the circuit near the end of the session, but he would end up splitting the Manor cars in 19th place with 15 laps on the board.